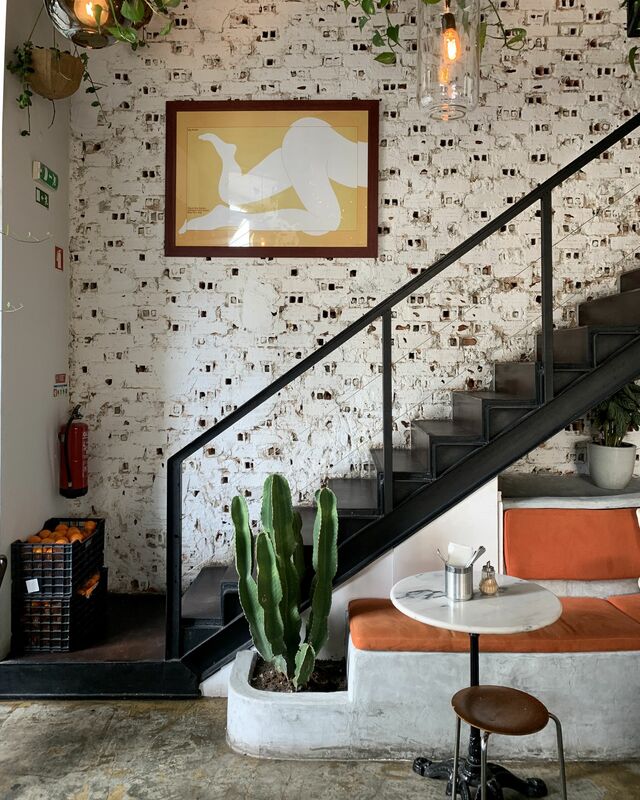 A gorgeous space in tones of beige and white, with delicious food with a Mexican kick. It occupies a store that was probably a bakery in a previous life, judging by the white tiles. 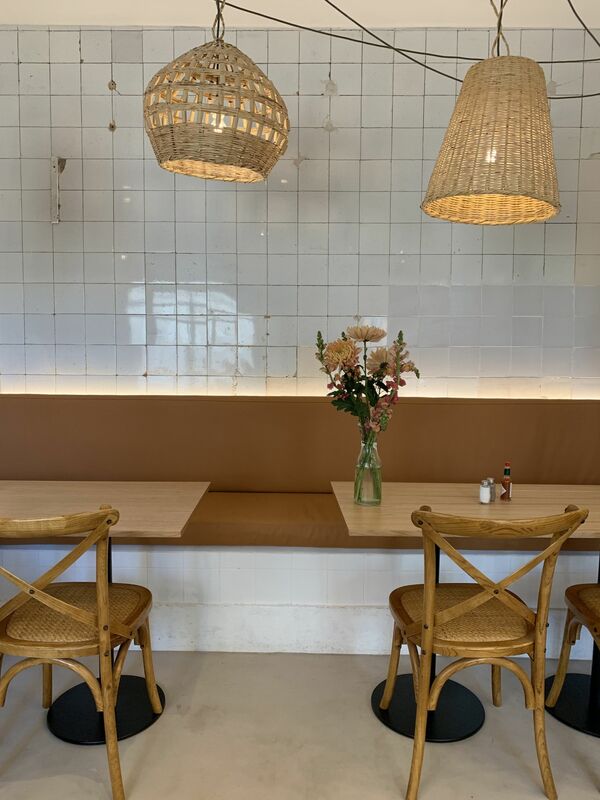 I love the wicker lamp shades and beautiful flowers – the space is just lovely! 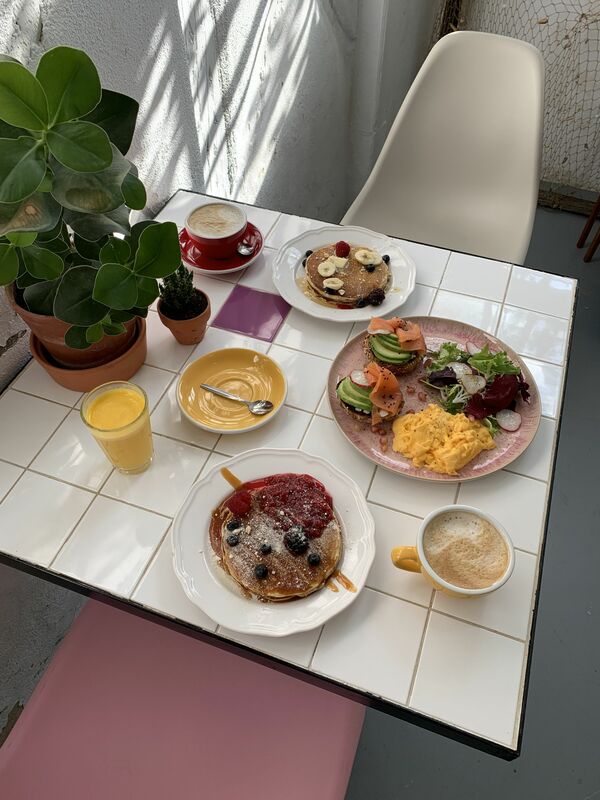 And the food did not disappoint: the guacamole was incredible, really fresh and full of flavour, and my huevos benedictinos (eggs benedict with a twist) were delicious – with the perfect amount of flavour and just a good spicy kick! Um sítio giríssimo em tons de beige e branco, com comida deliciosa com um toque Mexicano. 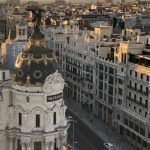 Ocupa uma loja que pelo ar dos azulejos brancos, devia ser uma padaria na sua vida anterior. Adoro os candeeiros de palha e as flores lindas – o espaço é lindo! E a comida não fica atrás: o guacamole era incrível, mesmo fresco e saboroso e os meus huevos benedictinos (eggs benedict com um twist) estavam deliciosos – a combinação perfeita de sabores e um toque de picante! This was my second time visiting Cafe Janis but I love this place so much I had to mention it again. 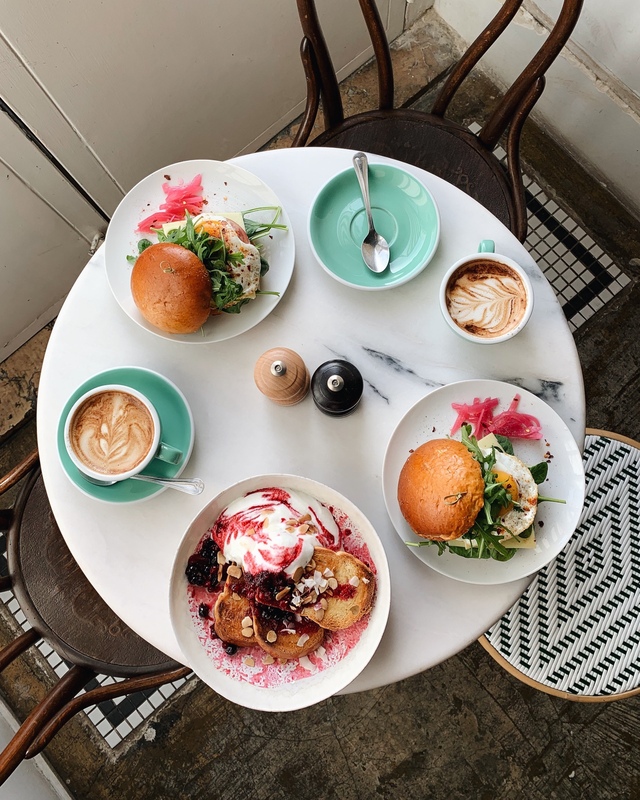 It is perfectly located in the square next to the Time Out Market, and it has a beautiful Parisian vibe – plus the most amazing wall with exposed brick painted white and a ceiling covered in plants! Their banana bread is divine but this time I tried the golden brioche which was absolutely delicious – and so Pink! Esta foi a minha segunda visita ao Café Janis, mas gosto tanto deste sítio que tive de falar nele outra vez. É muito bem localizado, na praça ao lado do Mercado da Ribeira (o Time Out Market) e tem um estilo parisiense lindo – para além da melhor parede com tijolo exposto pintado de branco e um tecto coberto de plantas! O banana bread deles é incrível, mas desta vez experimentei o golden brioche que estava uma delícia – e era tão cor-de-rosa! Just around the corner from Janis is the very scandi-cool Comoba. 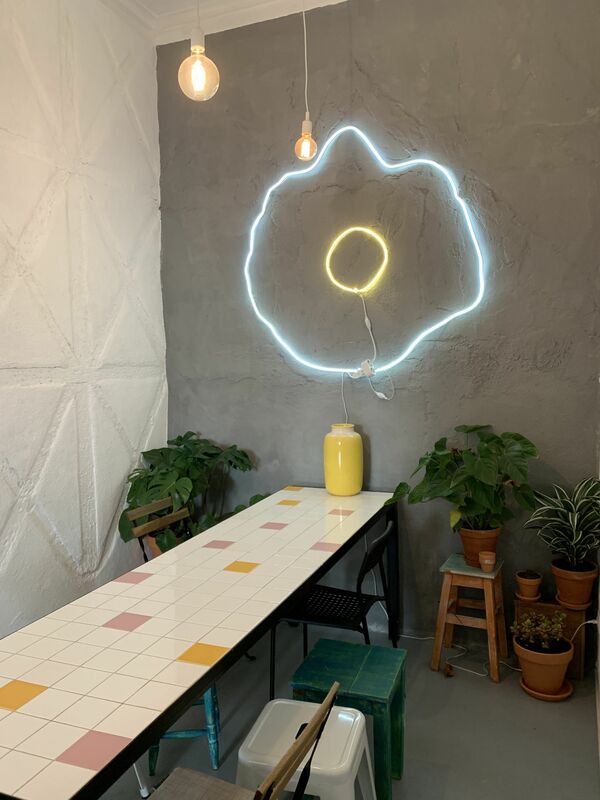 The decoration is super minimalistic and simple, making the most of the beautiful arches of the original building and adding modern accents of white in the lamps and tables, as well as cool benches and cushions for a pop of colour. They are famous for their colourful lattes and as it was winter I tried the Turmeric Latte – it’s surprisingly tasty, really easy to drink, and supposed to be excellent to fight off colds! Ao virar da esquina do Janis fica o Comoba, que tem uma decoração muito ao estilo escandinavo. A decoração é super minimalista e simples, aproveitando lindamente os arcos do edifício original e acrescentando toques modernos em tons de branco nos candeeiros e nas mesas, bem como uns bancos giros e almofadas coloridas. São conhecidos pelos lattes coloridos e como estávamos no inverno experimentei o Turmeric Latte – surpreendentemente saboroso, fácil de beber e pelos vistos é óptimo para lutar contra constipações! 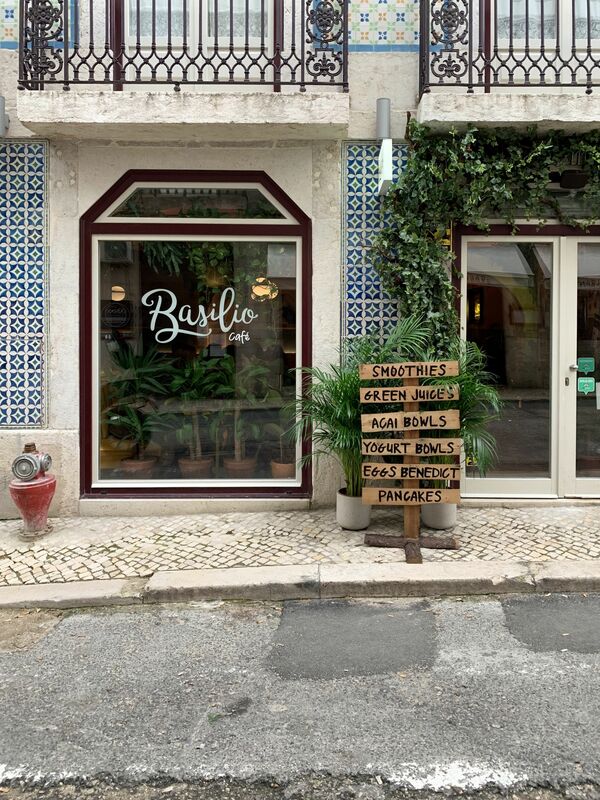 In a small street close to the river in downtown Lisbon, Basílio is a cool space that focuses on tasty, healthy food. I love the decoration in tones of green but mostly, I love the neon sign! Who doesn’t?! My highlight here was most definitely the ginger, turmeric shot – it was so good that I went back another day for a second taste, plus it comes in a tiny shot glass in the shape of a skull! For food, I tried the Ovos Nicolau, a delicious version of avocado toast, which I’d highly recommend for a light lunch. I also tried their banana bread with chocolate chips which was super tasty. Numa rua pequena perto do rio na baixa, o Basílio é um espaço bem giro que se foca em comida saudável mas super saborosa. Adoro a decoração em tons de verde mas adoro especialmente o sinal com o nome do restaurante em luzes fluorescentes! Quem não adora?! Adorei o shot de gengibre e curcuma (Turmeric) – de tal forma que até lá voltei noutro dia para experimentar outra vez. Para mais vem num copo de shot em forma de caveira! Para comer, experimentei os Ovos Nicolau, uma versão deliciosa de avocado toast que recomendo para um almoço leve. Também experimentei o banana bread com pepitas de chocolate que era muito saboroso. Not only is Early Birds’ space really bright, clean and with an egg shaped neon sign (love! ), it also has probably the best pancakes I’ve ever had. And that’s saying a lot, as anyone who’s ever been for brunch with me will tell you: I like my pancakes! O Early Birds tem não só um espaço cheio de luz e com uma decoração muito simples e bonita, com um sinal fluorescente em forma de ovo estrelado (amo! ), também tem das melhores panquecas que já comi. E isso vindo mim diz muito, como qualquer pessoa que já tomou brunch pode confirmar: adoro panquecas! 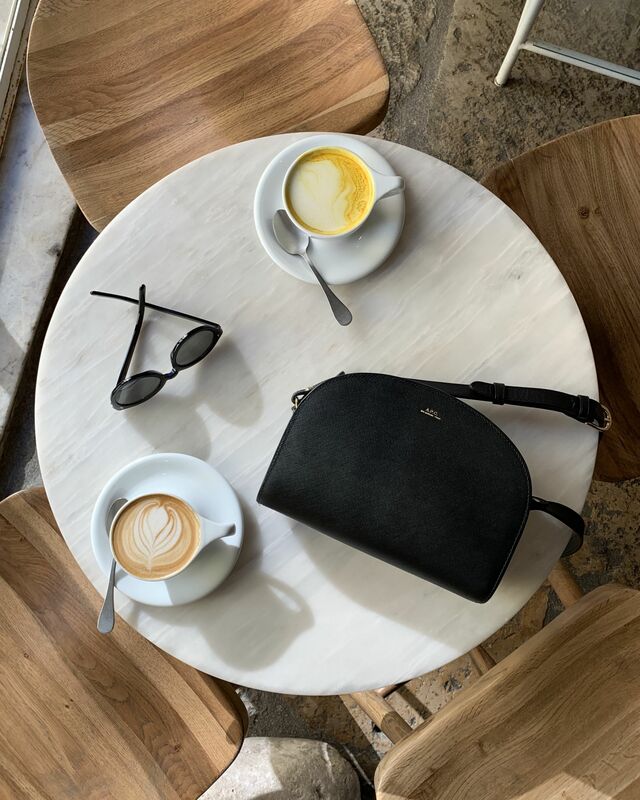 Hope you’ve enjoyed this little tour of new places I tried while in Lisbon! 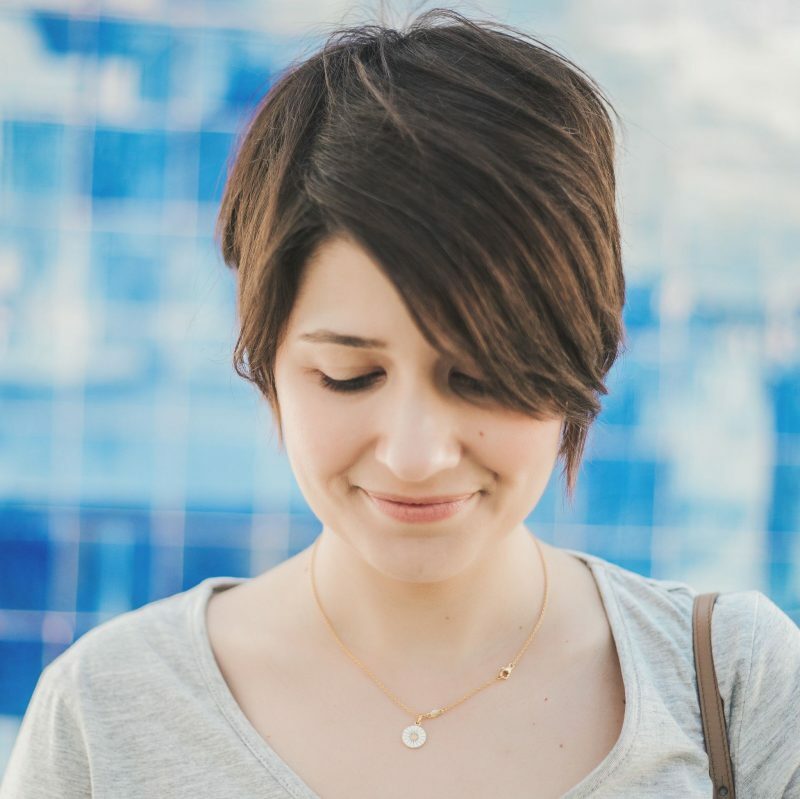 If you are heading to Lisbon and visit one of them, let me know what you think! 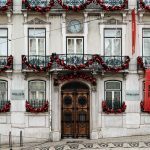 Espero que tenham gostado desta visita aos novos sítios que experimentei em Lisboa! Se experimentarem algum deles, digam-me o que acharam! Mas tudo isto é mesmo em Lisboa ou será que é em … Lisboa, Texas? Tanta coisa boa para explorar, caramba! E deviam, porque estes sítios valem bem a pena! !